I am sure by now you have all seen this hallway so many times, I share the pictures of it often. Our home has a hallway that is a big L shape, it is in the center of our home and something we all walk down multiples times a day. It links the garage to the house. What I am trying to say is that it is a big deal, and something I began tackling right when we moved in so many years ago. The one thing I have never shared here is the full transformation of it. Which is something I usually love to do, however after all these years my wainscoting is not quite done yet. I know, slacker status for sure! But, this Hallway transformation, DIY wainscoting is something I have to share. It is too much of a difference to not share, regardless of the smaller details that still need to be done. Let’s not call this a tutorial, because I plan to do one once the wainscoting is completely done, this is a hallway tour. I guess I felt my hallway with all of the work I have put in needed to get it’s time to shine and not be glossed over while explaining another project. This is what it looked like when we first moved in. 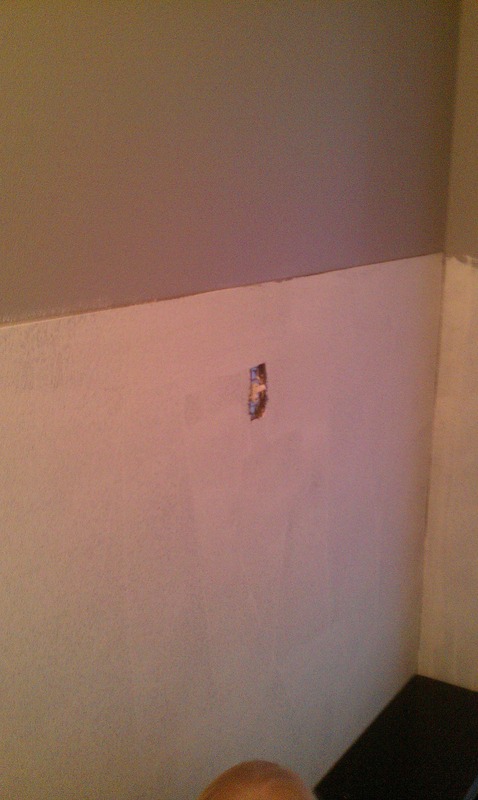 I have changed everything in here but the original drywall. 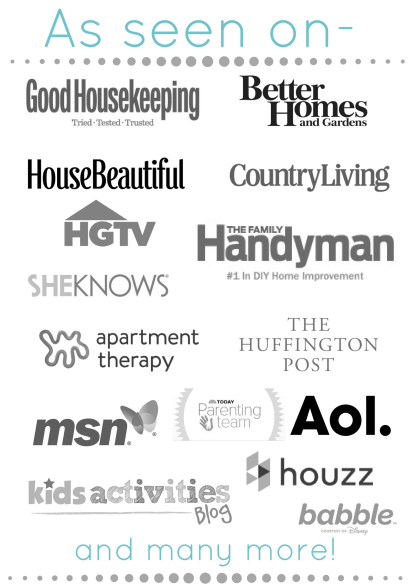 Adding wainscoting, new door hardware, new ceiling lights, a barn door, family command center, I have done it all! It has been years in the making, and has taken a lot of time and work. I am sure it could all have been done in one weekend if you do not need sleep, have kids, jobs or a life. Other than that a full transformation like this would take a few weeks at least. Yes, before you ask I will admit; I used a CD display case as a picture display. It was my early attempts at upcycling things. Without paint or more than proclaiming it be something else now. 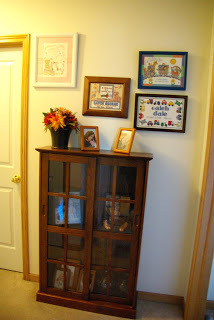 “I crown thee former CD player a cabinet for pictures.” said I, the decorating Queen in this home. This hallway was so dark, it has zero windows and is narrow. Dale was worried when I told him I wanted to paint the walls a dark gray, which I get… if a room is too dark you do not make it darker. But I knew the contrast of the dark gray walls and white wainscoting would be amazing. Let me say… I was right! 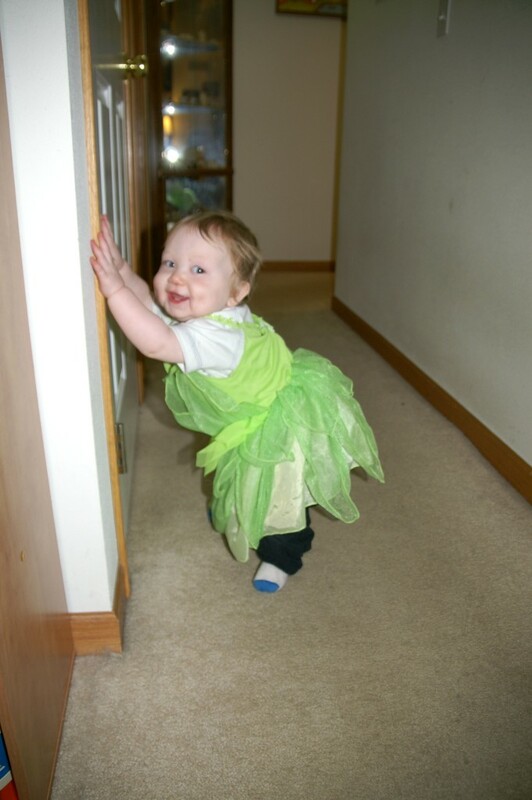 I cannot handle the cuteness of my sweet Caleb, here is his tiny self in a Tinkerbell dress, which I am sure he will hate that I put on the internet eventually. For now lets collectively enjoy the cuteness of him and cringe at what is going in the background with the hallway. Here is when the wainscoting went up. 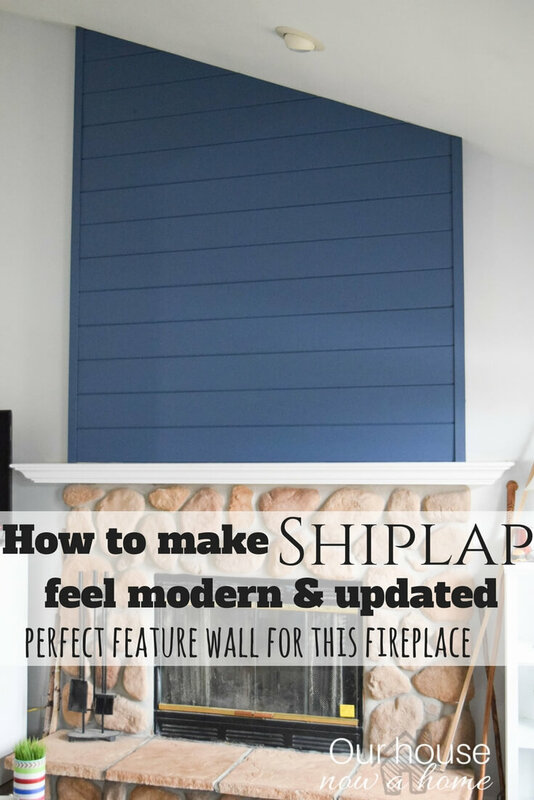 Because we have textured walls (which are horrible) I could not simply paint the walls white behind the wainscoting wood detail and call it a day. I had to put a backing board up, which was primed and painted white. Then the wainscoting wood pieces could go on. This way everything matched and had a smooth finish to it. I filled in the cracks in the wood with wood putty, which I will also explain the process of once I have the final piece added to it. 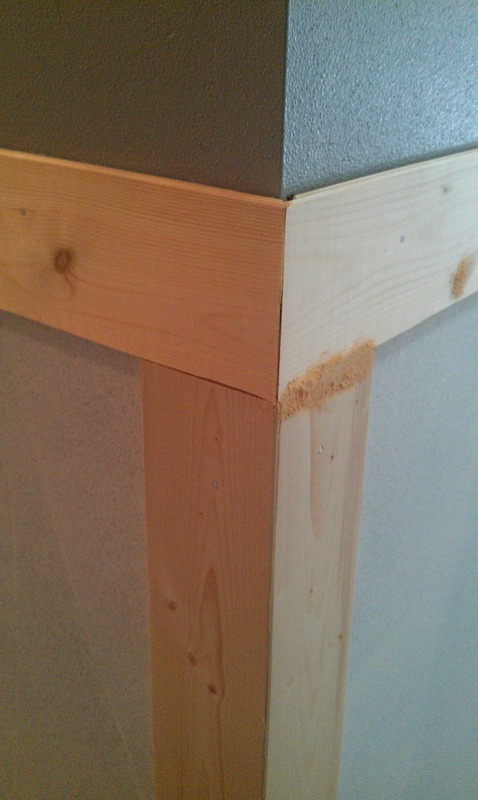 The top portion of it, a slight ledge is still needed. I would love to say the delay was planned, due to unforeseen circumstances maybe some huge catastrophe, perhaps to build anticipation. But…. life, kids, everything got in the way of us finishing. 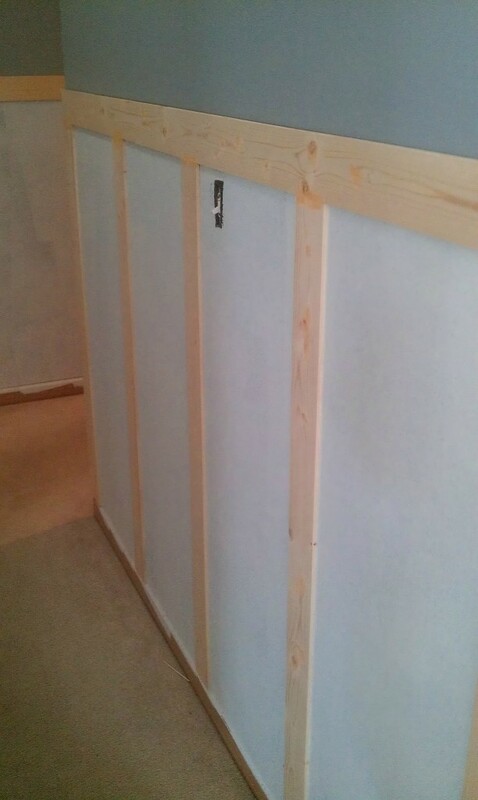 The problem is the wainscoting became “done enough” which takes the pressure off. 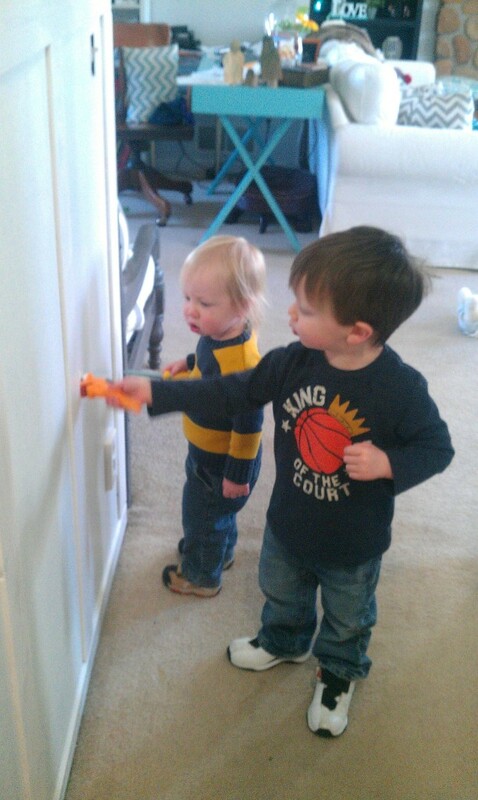 Hence my tiny babies that are not so tiny anymore helping with this wainscoting project. This was 2 years ago, and even then my kids were eager little helpers. They are such pro’s now I just give them instructions, the camera and they have at it with the table saw, getting things done. They do the work, I provide the sarcasm. The above picture is a in-between time. I had the wainscoting up, the walls painted. But the old door hardware is still on and we have not taken the plunge to wood floors yet. Changing out the hardware on all of the doors in our home was an expensive upgrade, but one I had been dreaming about. I wanted a classic look, and the door knobs we put in for that theme perfectly. I also updated the ceiling lights in here. This was not an expensive thing to do because I shopped around and purchased used. I have to say it is weird that the little blue table in the corner has stayed there since the day we moved in. I did paint it, but other than that only changing what sits on it. For some reason it works really well there and I am at a loss of what else I would put there anyways. 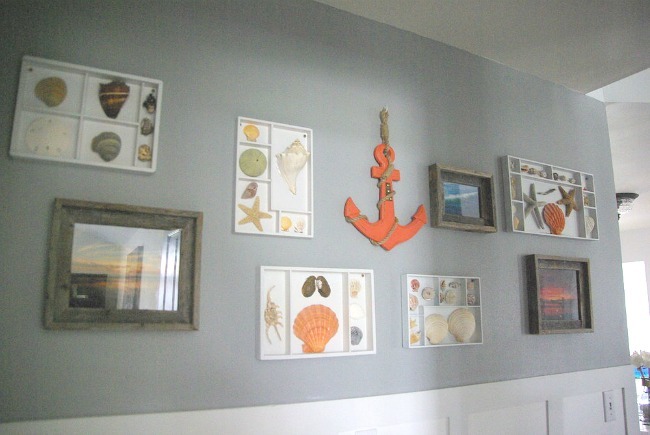 I created a shell display and coastal gallery wall. The shells here are ones we found in my hometown of San Diego, California picked up in local shops or found on the beach. The pictures are ones from my favorite spots that I went to growing up. I wanted to have a little bit of my home here in the country tiny town in Wisconsin. One of the most recent hallway projects I have done is the family command center. 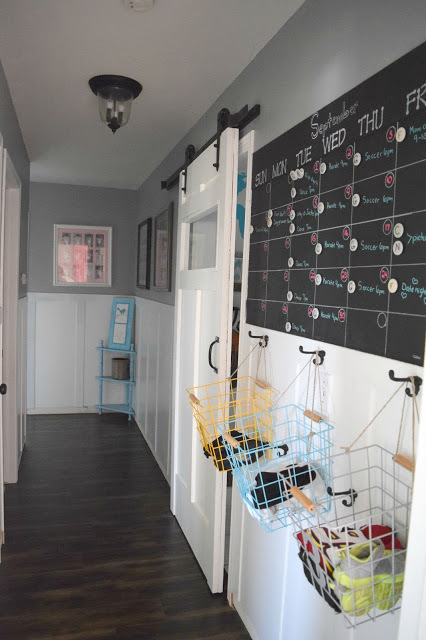 I had created this great organization station in our laundry room (which is still getting done) but the function of it worked for my kids school supplies. I had an issue with their extracurricular gear and our crazy schedule. My kids are beginning to read and this helps all of us stay on top of what is going on and when. It also utilized a spot in the hallway that would be otherwise un-used. This is where the former CD display case was. I feel like this is a much better function now. We added the wood floors to our living area and hallway about 2 years ago. 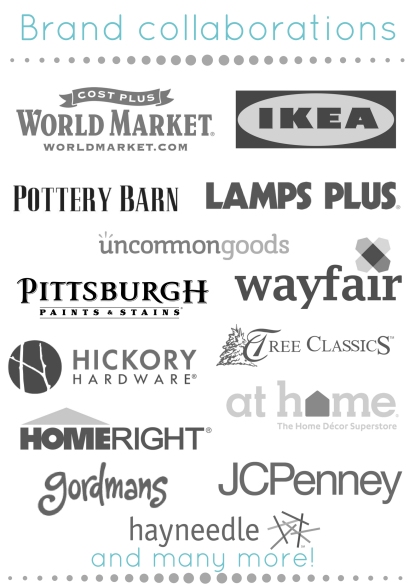 We were always dreaming of them and saving away money for the “one day” it would happen. The day came to us unexpectedly when we were dog sitting my in-laws dog. We were out for the day and came home to a mess of runny, stinky, in the living room, dining room and down the hallway mess of poop. Their dog had a accident, a big one in our home. The sh** literally hit the fan. After carpet cleaning and still seeing the dog poop stains I could not do it anymore, we bit the bullet and put in hardwood floors. We had hoped to save enough to pay someone else to do it. I feel DIY-shame for saying that. I adore the results but putting in almost 1,000 sqft of flooring was a big job. One that I am happy we did but hope to never do again. Because I decorate for my family, our needs first and foremost making and putting in this barn door was such a good move for us. Yes, I love the way it looks and had been swooning at barn doors long before we had one. But, this tiny spot is where our laundry room is, the nook for the organization station, the garage door is 3 ft away from this door, my kids bedroom doors are here as is a hallway closet. There is a lot going on here, before the barn door was set we discusses getting rid of the door. That was nixed when I realized that meant a picked up and organized laundry room needed to happen 24/7. Not going to happen! Breaking open the wall and installing a pocket door, then the idea of the barn door came to me and I was hooked. Because we have a standard suburban home I try to keep the “country and rustic” look to a minimum in. It does not mesh with the house, so I tried to create a streamlined version of barn door. 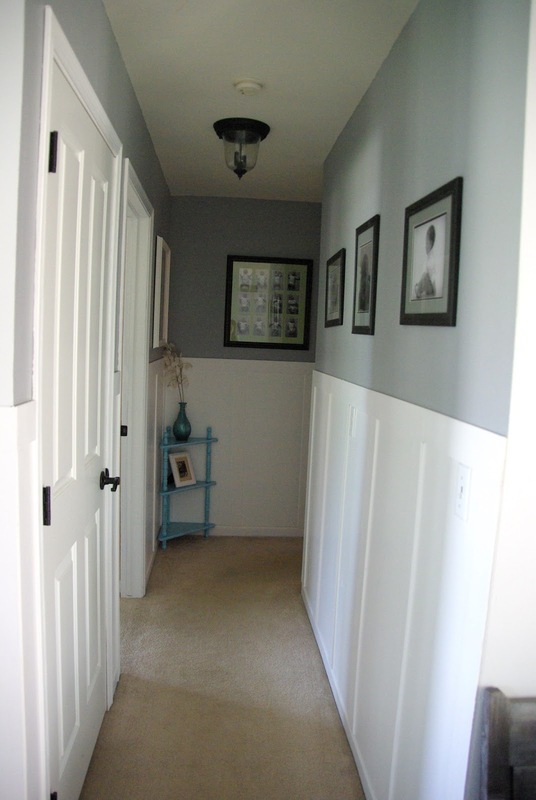 As I said, this Hallway transformation, DIY wainscoting took a while to create. It was done in steps, and over many years. Which actually worked to my advantage. Because I did not rush into redoing it I was able to find pockets of function in the command center, think of a better way to have the laundry room door work, and get a good feel for the space. I have said it before that I am not a patient person but in a case like this hallway, having it be a slow burn has been good. Although I am ready to fully finish the wainscoting and finally call it done. Checking things off on my to-do list is one of my favorite past times and this has been on it for a very long time. They say the kitchen is the heart of the home, which I agree with. 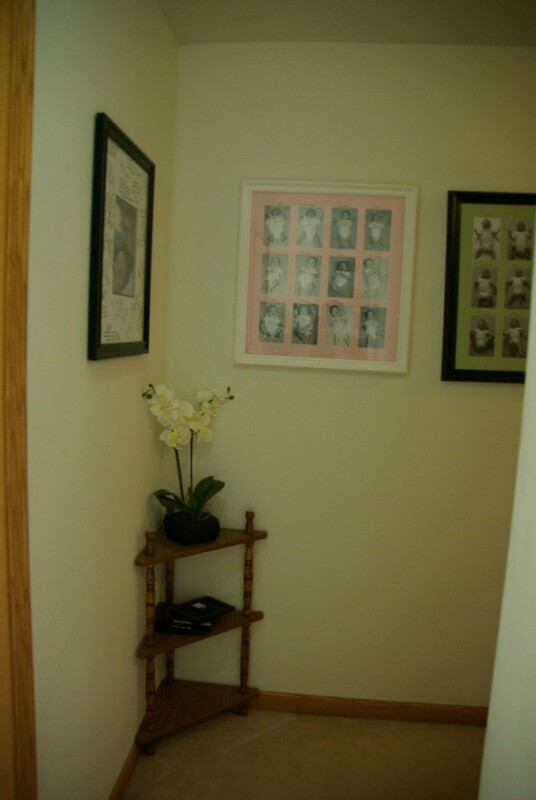 However, this hallway is the center of our home, literally and figuratively. We pass by it, run through it, bowling has happened here, spontaneous Lego building, the kids zoom cars down it. So much happens in this tiny space, it is nice to have it fit the feel of our home and family. I did ask Dale if we could knock out the ceiling and put in a few skylights to really make this place shine, he said no. Sighting our mortgage and other bills as the reason, being a responsible adult is no fun! You know what else is no fun? Mondays! 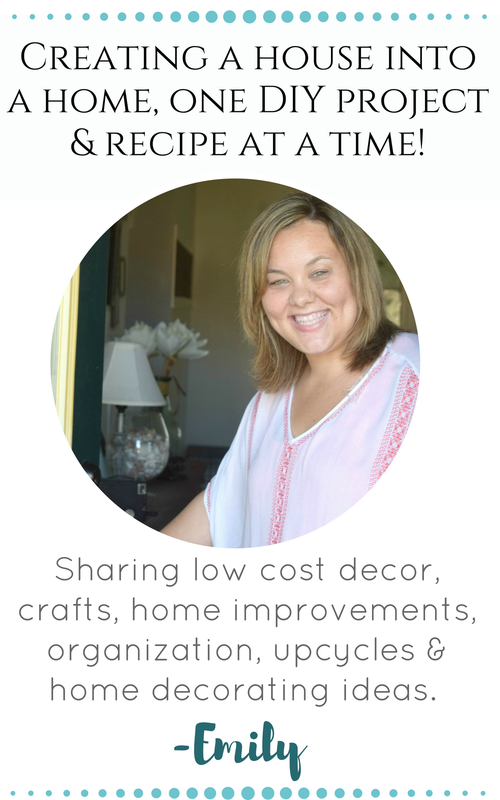 Today I am off to start the week, clean the house after the tornado that is a weekend with the whole family home, get the kids off to school, and maybe start working on the wainscoting some more! Have a great week friends, we got this! This is amazing Emily! What a great idea, I love the wainscoting!! You make it look so easy! Thank you! It has been a long process but was just a few steps. I made it longer by putting so much of it up. 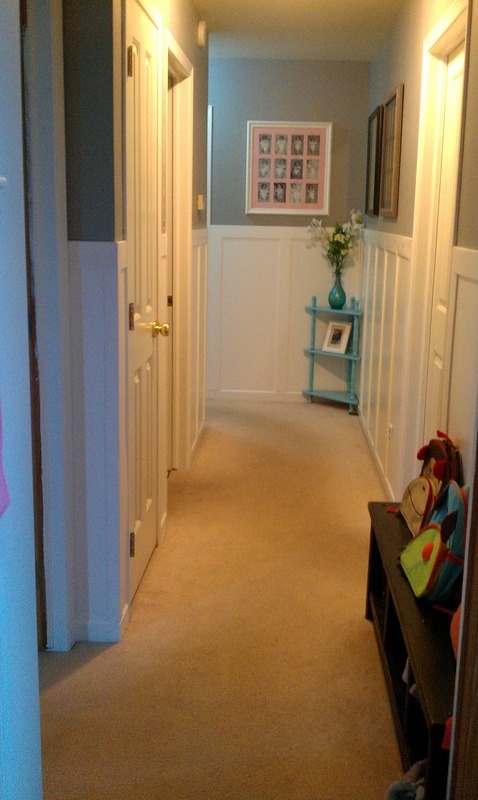 It’s amazing what a transformation wainscoting can make! I love your hallway, amazing job! LOOKS SO GOOD. I love wainscotting. Me too! I have to keep myself in check otherwise I would put it in my entire house. Your transformation is beautiful! It looks so organized and neat! Love how you decorated it as well! I like your baskets. I go back and forth between wanting everything open so I notice if the kids throw stuff in that doesn’t belong and wanting to have closed things so i don’t have to see it when they do. Ugh, the struggle is real! Kids and their “stuff” are never easy to handle. I love how much you brightened up the hallway. Thank you, it was really needed because it is naturally a dark space. I love what you did in your hallway!! 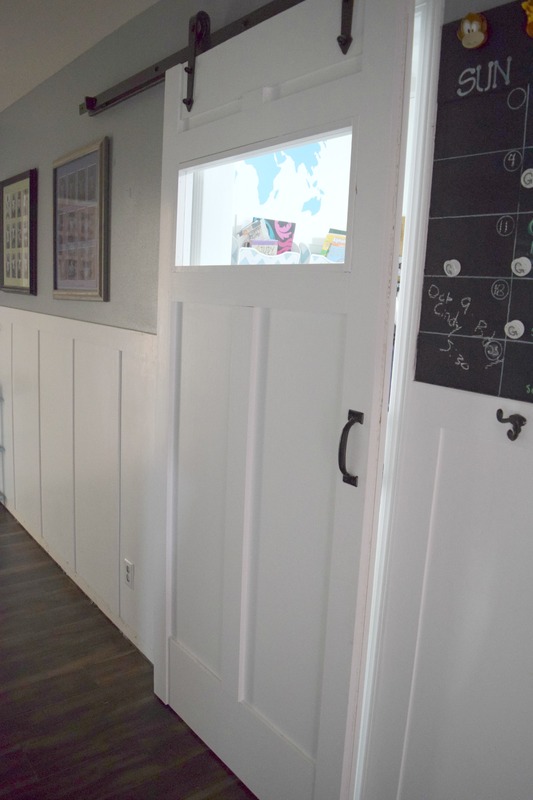 The wainscotting is awesome and I love love love the sliding door. Everything is so open and bright. Great job! Love your hallway! The wainscoting and barn door look great! The wainscoting really upgraded your space. Love it!! That has really made a difference. It is so nice to see what you can do with a little bit of imagination. Thanks! 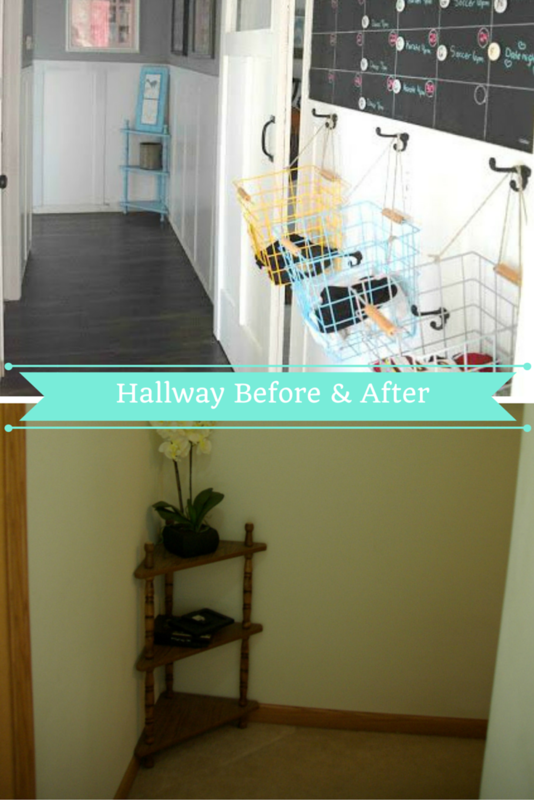 The transformation came together for this hallway well! WOw what a transformation. It is a beautiful new look. The transformation is incredible. Love the chalkboard weekly calendar, too. 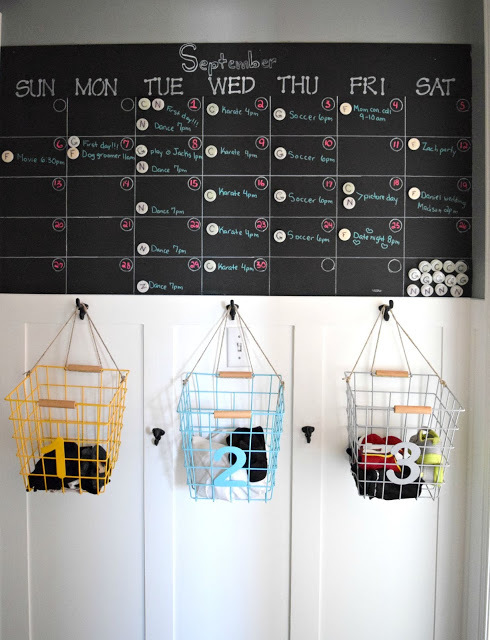 You’re so organized and with little ones too. Just wow! Thank you, I try to stay organized because of my little ones. 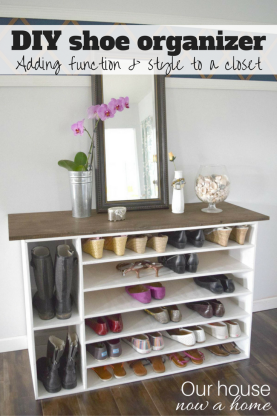 They can overtake a home and make a mess with the best of organization plans. Ok, I’m TRULY impressed. Scrolling down, I gasped aloud at the transformation and my daughter thought I must be reading about food or something! I want a chalkboard weekly calendar. I need to make one. Wow, thank you so much for saying that! I am happy you enjoyed this so much! The chalkboard calendar gets used all the time around here! This is such a great idea. The wainscoting really does add a high-end look to a home. 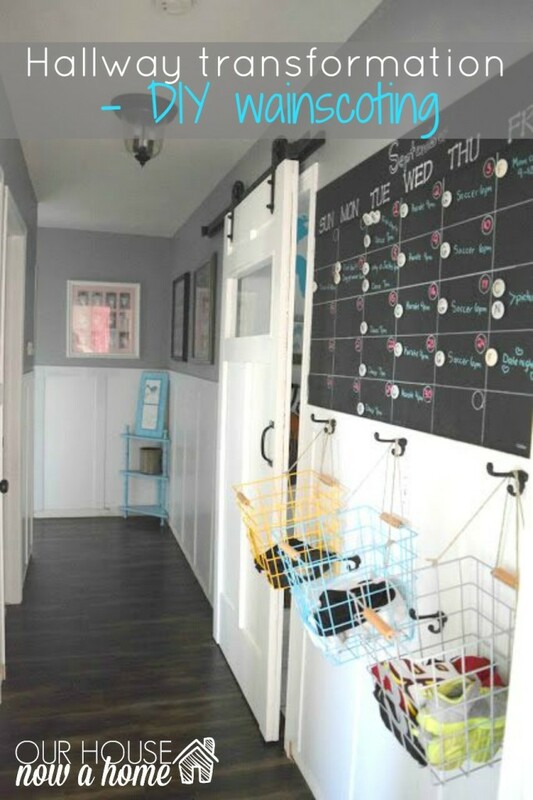 I love the chalkboard with the hooks under for the kids. Oh that would be a beautiful bathroom, I love the idea! Another great project. I love how bright and open your hallway looks. That looks amazing! I wish I had a hallway large enough to do that with! Thank you! This hallway is abnormally long for our home and I felt I needed to put more effort into it. I love it! 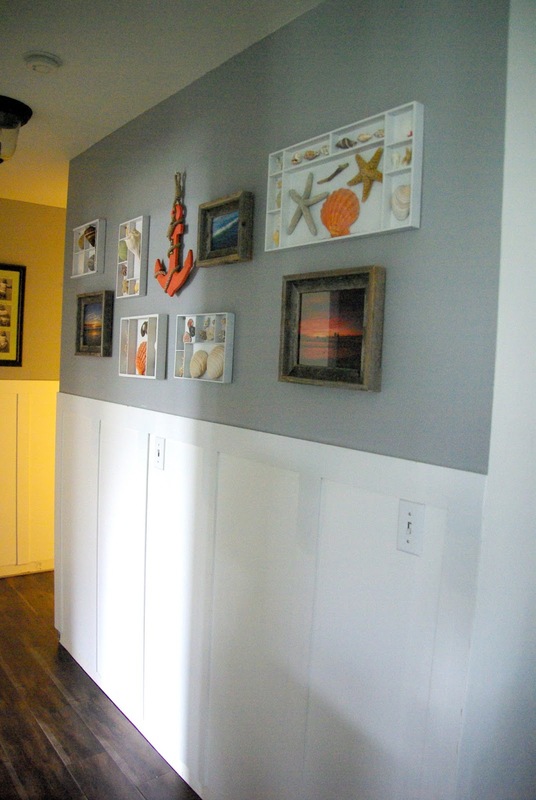 I love the look of wainscoting and would love to have it somewhere – anywhere – in my house. Me too! I have to limit myself otherwise I would have it in every room in my home! Love, love , love that wainscoting. 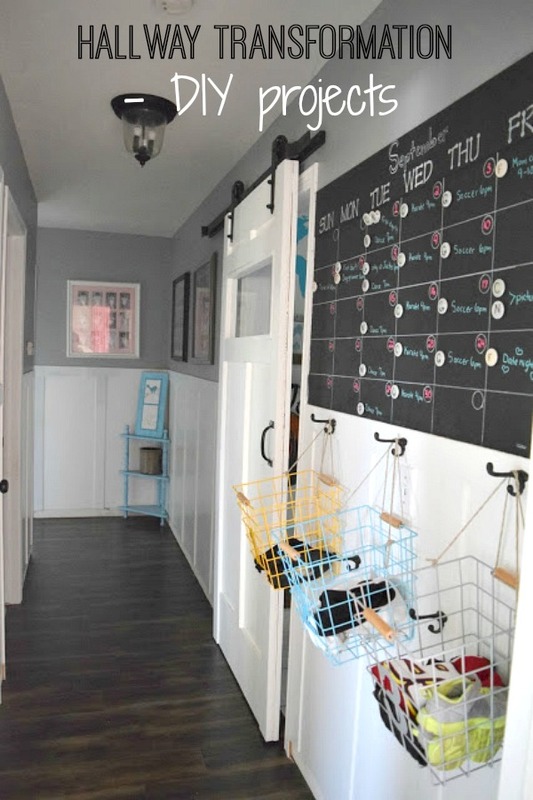 And the command center is a great tool to help you keep track of all of your kid’s things. It will come in even more handy as they get older and are involved in more things. Thanks! I can only imagine how crazy kids schedules get, right now I only have two in school. I love it! It looks so good!! WOW! What an amazing transformation! Love what you did, looks so fresh and functional. Wow! Your hallway looks amazing. 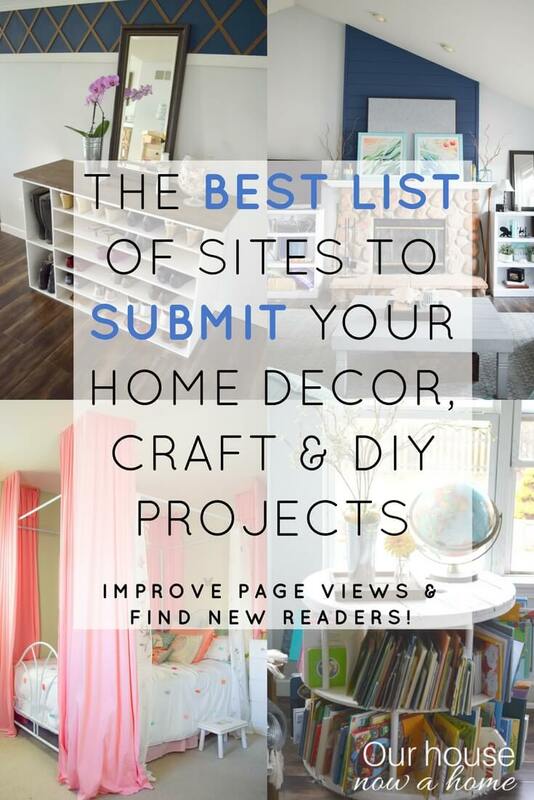 I love seeing all your great projects. 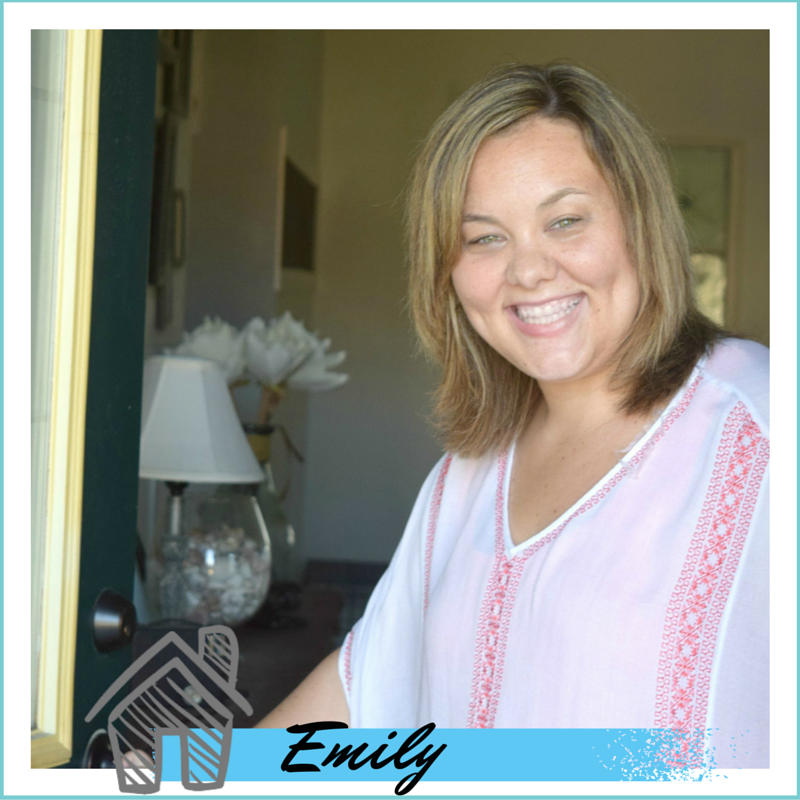 Thanks for sharing the pictures of your lovely home. Caleb is too cute. 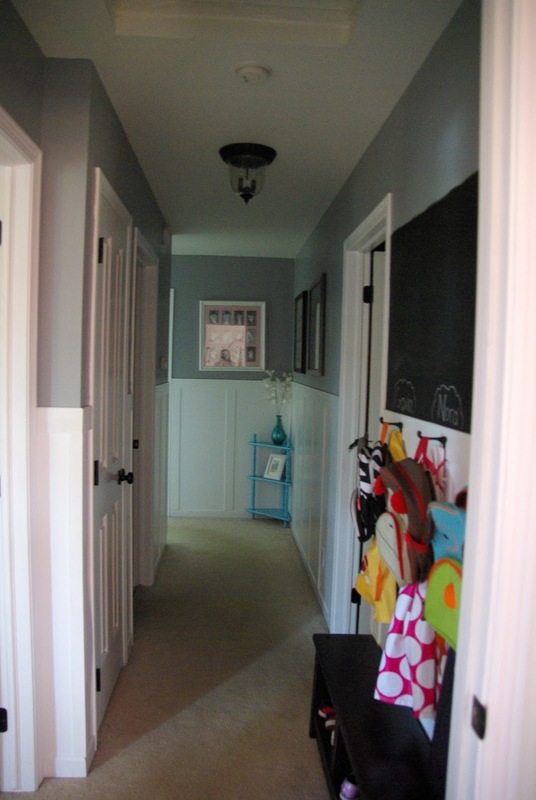 I love the color scheme of the hallway and how it appears to be more spacious. Thanks! He is a cutie and was such a roly-poly baby! The wainscoting is a big improvement. It gives a nice touch to the hallway and makes it look much better. wow what a transformation – I bet you are so loving it now. I love the wainscoting & really want to do that somewhere in my house. Thank you! Adding wainscoting to a home is such a beautiful update! This is such a wonderful transformation. I LOVE the board and batten, the command center and the sliding door. Great job! This looks fantastic. I love the colours you have used but also the innovative ideas to help transform it into a useable space! Thanks! I try to make my home be functional in every single space. This is such a fabulous transformation. I totally understand how projects can longer than they should – if you didn’t have kids, work, clean up, and all that other fun “life” stuff – they’d be done in no time. Beautiful job! I seriously wish you could just come over and transform my entire house. And that tinkerbell picture, OMG! Heart melted! Haha! Thank you! I think it would be fun to decorate other peoples homes!